Have you seen our big white bus ambling around town? 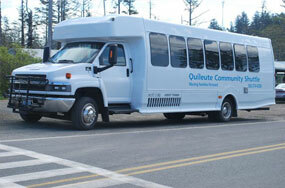 The Quileute Community Shuttle is “moving families forward” in La Push! This is a shuttle that is free to all members of the West End community. We are hoping to increase access to employment and education by supplementing the current public transit schedule. We also encourage riders of the Community Shuttle to utilize Clallam Transit services whenever possible. Click on the schedule to view or print.